Virunga National Park, a World Heritage site, is home to more than a quarter of the world’s remaining 880 critically endangered mountain gorillas. Volcanoes. In this spectacular setting, one of man’s closest relatives lives as they have done for thousands of years. Mothers care for their infants, juveniles play without a care in the world, adolescent males wrestle in preparation for future tests of dominance, and the family patriarch, the dominant male silverback, keeps a watchful eye on all. A Mountain Gorilla family, which can number from four to fifty individuals, is led by a single dominant adult male known as the “Silverback”, a name derived from the grey hair that develops on a male’s back as it reaches adulthood. The Silverback is responsible for protecting the family from predators or other threats, including solitary Silverbacks intent on claiming females as their own. Some families contain more than one Silverback, but only one is dominant and that male alone is responsible for mating with the adult females of the group. Despite all the lore about the ferocity of the mountain gorilla, in general they are very peaceful creatures. Most days are spent foraging for food, playing, and grooming. Aside from mock fighting amongst juveniles, displays of aggression are reserved for challenges to the Silverback’s dominance or direct threats to the family’s well-being. You will have the opportunity to observe the gorillas for up to an hour. Gorillas may surround you while playing and eating in the trees, or the family may be at rest in an open grassy area. 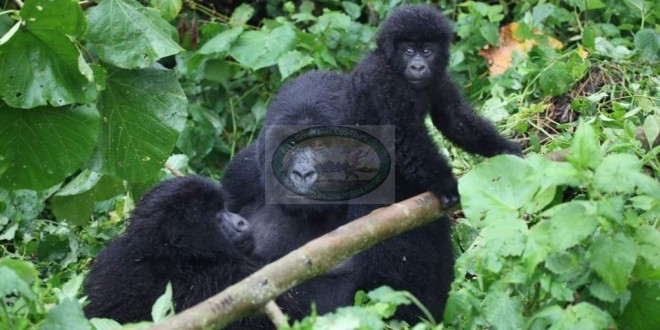 With Green Hills Ecotours you will have a truly fantastic Gorilla trip and experience the adventure of a Lifetime. The Mountain Gorilla as a species has long been close to extinction. Poaching and wars have killed many of these animals, and illegal charcoal production has destroyed much of their habitat. Many conservationists have dedicated their professional lives to furthering our understanding of this species and raising awareness of its plight. Dian Fossey, whose work was immortalized in the movie Gorillas in the Mist, is perhaps the most famous of these. More recently influential journalists have brought the world’s attention to Virunga’s Mountain Gorilla population. If you are fortunate enough to visit the park’s mountain gorillas, you will be awestruck and forever changed. In tracking Congo’s mountain gorillas with Green Hills Ecotours, you will also be helping to ensure the survival of this magnificent creature.